The number of drivers breaking down after hitting potholes has seen a "concerning" rise, according to the RAC. The RAC saw an 11% jump in breakdowns caused by poor quality roads in the last three months of 2017. The firm blamed snow and icy conditions, and warned many roads are "hanging in the balance" if conditions are particularly cold or wet in spring. 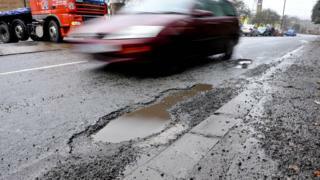 Drivers can face a bill of hundreds of pounds if their cars hit a pothole. The Department for Transport said it was investing £23bn to increase capacity and improve road journeys. The RAC was called to 2,830 pothole-related breakdowns between October and December, compared with 2,547 in the period a year before. RAC chief engineer David Bizley said the figures would be "met with concern" among drivers because potholes represent a "serious road safety risk". Driving into potholes can cause broken suspension springs, damaged shock absorbers and distorted wheels. After several years of improvements to road quality, the latest analysis suggests it has gone backwards for the third successive quarter, he said. Most potholes develop on local roads which councils are responsible for, rather than motorways and trunk roads. Local councils warned on Thursday they would need to spend £12bn to address the current backlog of road repair work, including fixing potholes. The Local Government Association called for extra government funding, saying that motorways and major trunk roads receive 52 times more funding than local roads. Three councils are now trialling the use of cameras mounted on bin lorries, buses and electric bikes to capture images of potholes and detect weak spots. Could binmen become pothole heroes? Eddie is the first driver in Britain to have a pothole camera installed on his bin lorry. He is part of a trial, funded by the Department for Transport, that gathers real-time data on the quality of the road network in Thurrock, Essex. All Eddie has to do is keep the camera clean and go about his usual route, covering up to 60 miles a day, 5 days a week. The images are then relayed back to engineers to examine not only where existing potholes are, but where they are likely to develop in future. Most councils use an on-board camera system on bin lorries for health and safety purposes. It is hoped that in the future these fleets could become the frontline in the war against potholes.